The Royal Ascot dress code is like no other, and the event is easily one of the most formal in the British calendar. While attire in general has become much more casual (case in point: leggings are more popular than jeans), Ascot is not the place to relax the rules. Oh no—with the queen and the rest of the royals in attendance (potential for a DoC spot is high), the June event, which started in 1711, draws a crowd of over 300,000 every year, and attendees dish out a collective £34 million on the correct attire. Getting the dress code right is one of the most important aspects of the event—it's not just about placing bets on horses. However, this year, the dress code has been relaxed just a little: Jumpsuits are now—shock—acceptable. This is incredible news, especially for those who aren't keen on wearing dresses. The trouser suit is also officially okay, provided it's ankle length and in matching material. But that's not where the fashion restrictions end, as there are many important codes to adhere to. The first thing you should know is which enclosure are you going to be in. This will dictate how formal your dress needs to be. For example, if you're in the Royal Enclosure, you'll need to ensure you're wearing a hat or a headpiece that measures at least four inches in diameter across the head. However, over in the slightly less formal enclosures, the Queen Anne and Village, a fascinator is totally acceptable. If you're still a little confused, fear not—we've got all the rules you need to know when attending Ascot. 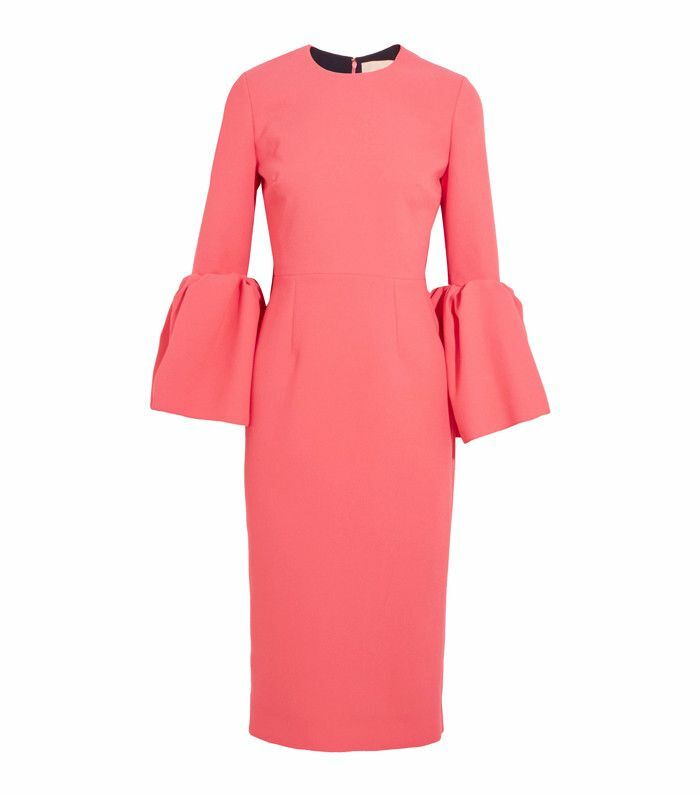 Keep scrolling for the Royal Ascot dress code and shop some key pieces now. Dresses and skirts must fall just above the knee or longer. Dresses and tops should have straps of one inch or thicker. Strapless, off-the-shoulder, halter-neck and spaghetti-strap tops are not permitted. Jackets and pashminas can be worn, but dresses and tops should still comply with the above rules. Trouser suits are welcome so long as they are full length and of matching material and colour. Jumpsuits are welcome but should be full length to the ankle, with regulations matching that of dresses. Hats must be worn, but a headpiece that covers at least four inches in diameter is acceptable. A hat, headpiece, or fascinator should be worn at all times. Strapless or sheer-strap dresses and tops are not permitted. Trouser suits and jumpsuits must be full length and adhere to guidelines above. No replica sports shirts permitted. This dress fits within the hem regulations, as it hits just below the knees. Want more hat inspo? Check out the legendary milliner Stephen Jones's website. A suit by Altuzarra that works for Ascot and the office. Win-win. Remember: You can't do strapless or have thin straps. Something simple like this will go with many different outfits. Next up! The body shape calculator will make all your clothes look incredible.